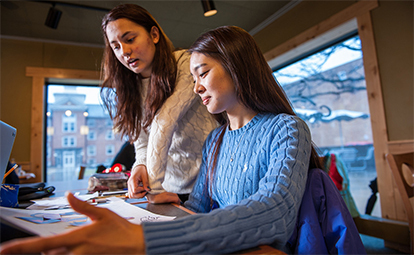 Students who choose a persuasion and advocacy major in communication excel at influencing others on social issues and advocating for positions and causes they feel passionate about. You'll learn how people, businesses and communities use communication to shape their identity. You'll build international communication skills needed to succeed in personal and public settings. You'll learn to think globally and use rhetorical intervention to communicate ethically in writing and in actions. You'll find your persuasion skills in demand globally in professions such as law, governmental relations, political science and human services. Thirty-two Education Abroad opportunities that build global communication skills and multicultural perspective. Active student groups dedicated to personal development, passionate causes and professional advancement offer leadership opportunities as well as social interaction. Faculty with established and ongoing research on local and international issues. Professor Eddah Mutua was invited by the Embassy of Rwanda to present her research on women and peacebuilding in Rwanda on the 20th anniversary of the Rwanda genocide. She also earned a 2014 Minnesota State Diversity and Equity Award for her work on a collaborative project between the university and three area school districts. Notable aluma: Sheila Reger '85 is the former Commissioner of Administration, Human Resources Director for Minnesota State and works as a consulting manager for the University of Minnesota.